It was a moment made to go viral. Some unknown Home Depot employee couldn’t resist recording the incident from the security screen using his phone. Once it was leaked, it began making the rounds. Strickland’s church, Jewel Lake Community Church, posted it on its Facebook page. Chris’s brother Dale posted it on YouTube with the simple title, “Chris to the rescue.” From there it propagated around the web, logging hundreds of thousands of views. It’s a simple, heart-warming story. A young man, just three months into his first job, saves a baby girl from injury or death a split second before she would have hit the concrete floor. Strickland is being hailed as a hero. And there’s talk of how he was in the right place at the right time. But there’s one other element to the story that should be highlighted: Chris Strickland was paying attention, and he was ready to serve. His saving the day in what could have been a tragic accident was no accident. Biographies are written and documentaries made of people who did great things that changed millions of lives and altered the course of history. Most of us will never be one of the great world-changers of history. However, for every great and world-changing hero, there are millions of ordinary people who have opportunities every day to make life better for the people around them. Though it was an unfortunate accident that the baby girl fell out of the cart, it was not an accident that Chris Strickland caught her. He was ready, willing, and eager to serve. Yes, he was waiting for the baby’s father to complete his purchase. 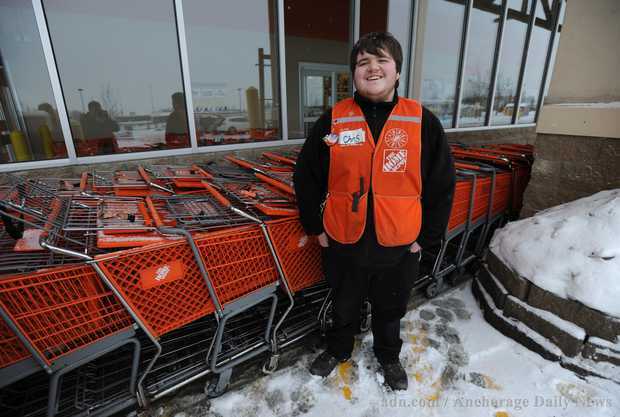 It was Strickland’s job as a “pro-lot loader” to help customers haul big and heavy construction materials out to the parking lot and load them into their vehicles. In other words, he was paying attention, monitoring the situation, and keeping himself available in case something bad happened. So yes, Christopher Strickland is a hero who probably saved a baby’s life. And yes, he was in the right place at the right time. But more important than either of these, he was paying attention. And most importantly, he was ready and willing to serve his fellow human beings. The fabric of human existence is made of millions and billions of these small, everyday moments. They are moments in which we are truly human, each in our own way. Moments when we see what needs to be done, and simply do it. In your daily life, what attention and service can you offer to your fellow human beings? We’d love to hear your ideas and experiences.